As you may know, Impala SS cars are based on the regular Caprice chassis line, and things on Impalas could also be on Caprices, like heavy duty suspension, the LT1, etc. 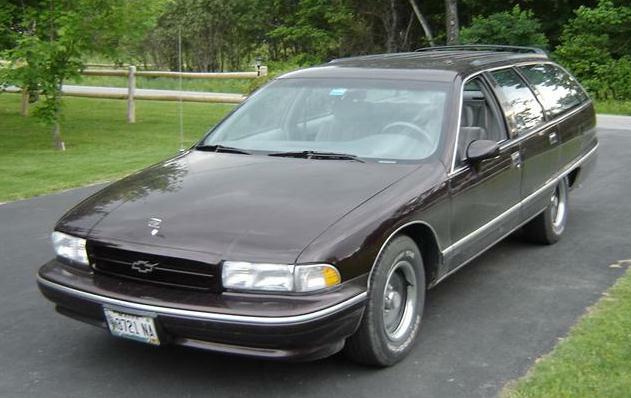 The wagons were big and heavy and pretty much got everything the Impala SS got with the exception of the rear end, which on the wagon had either 2.56 (me) or 2.93 rear gears and 12" drum brakes. 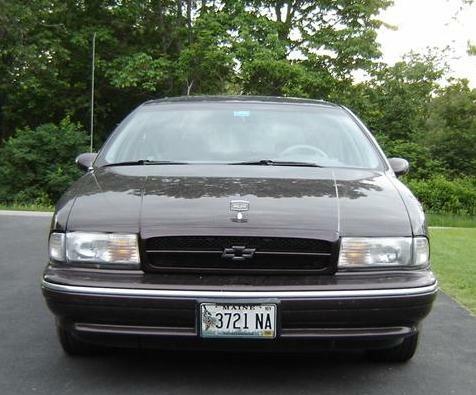 Impala SS's came in three colors: Black, some dark olive green, or Dark Cherry Metallic (DCM). All Impala SS's also had Gray interiors. 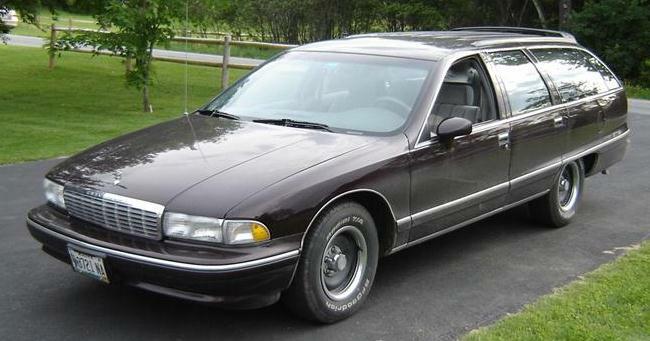 Well, my wagon is DCM and has a gray interior...I'm not that far from Impala if we change a few things. Most obvious would be wheels, which is discussed on another part of this web site. Another item is the grill...please enjoy the photo's below. Switching them is a snap, minus the need for a few different fasteners. Pardon the dirty car in the lower shots, but this spring it has been raining everyday. The below photo was modified, I need to find something to plug my hole in the hood. Thanks to RMS Autoparts in Texas. They had some great customer service and good pricing. They (grill and emblem) are OEM and ran me, shipped to my place, $125. GM still sells the grill in all three SS colors, this one is DCM. 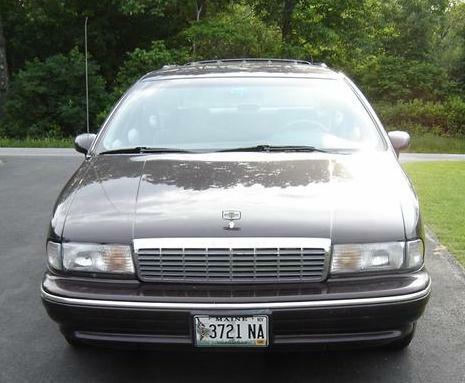 Aftermarket grills run about 60 bucks, but in my case, would need to be painted which is more of a hassle that what it's worth and I might have to deal with fitment issues as stated on some of the Caprice message boards. The hood emblem is gone and I'll fill the hole with something until I can find a Caprice LTZ emblem, which lays flat on the hood yet fills the hole left by the emblem.